There are birders who watch hawks and there are hawk watchers who bird. These, the hawk watchers, are the people who can’t stop watching the skies, even when the view is obstructed by a rainforest canopy or a massive layer of dark-gray clouds, the ones who yell, “Black Hawk!” while pointing to a pinprick in the sun. Raptor identification has developed into a distinct skill, one that has been supported by a steady stream of guides written by some of the best writers and experts around—Pete Dunne, Clay Sutton and David Sibley; Richard Crossley; Jerry Liguori; Brian K. Wheeler and William S. Clark. 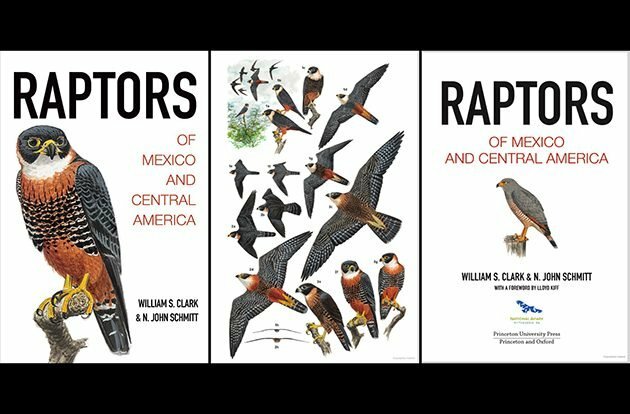 Raptors of Mexico and Central America by William S. Clark and N. John Schmitt joins this roster of outstanding hawk guides and fills a gaping hole in raptor coverage. This is the first identification guide that I know of that covers Mexico (technically North America but rarely included in North American raptor guides) and Central America. 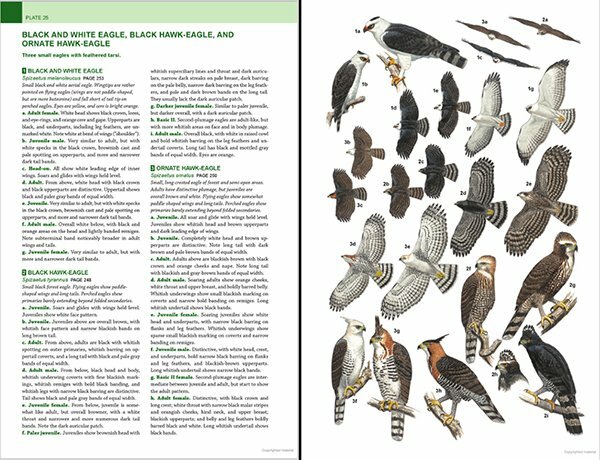 The guide presents 69 species and 1 subspecies, from “NEW WORLD VULTURES: Cathartiformes” to “OSPREY: Pandioninae” to “FAMILY: Accipitridae” (Kites, Hawks, Eagles, Hawk-Eagles), to “FALONIDS: Falconidae” (Falcons, Forest-Falcons, Caracaras, Kestrels, Merlin). Owls are not included, though they sometimes are in ‘raptor’ guides. 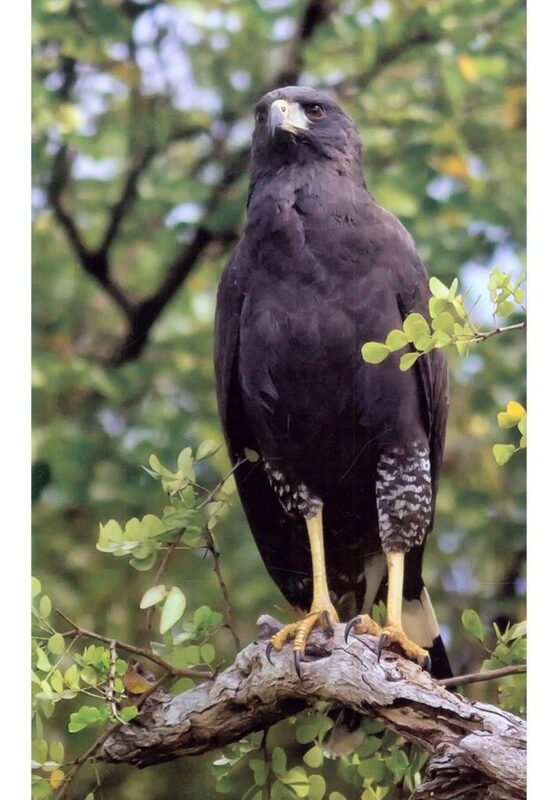 I am guessing that the term ‘raptor’ is used in the title to denote wider coverage than ‘hawk,’ which is sometimes limited in common usage to hawks and eagles, leaving out falcons, New World vultures, and Osprey. 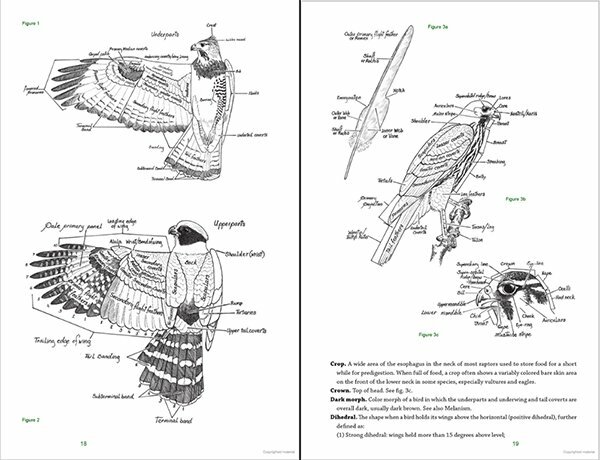 Like Peterson’s Hawks of North America, 2nd edition (Houghton Mifflin, 2001), which Clark co-authored with Brain K. Wheeler, Raptors of Mexico and Central America has a two-part structure: (i) Plates—artwork by Schmitt on the right, detailed plumage descriptions on the left; (ii) Species Accounts—two to six page descriptions of each species with photographs and range maps. Now, it isn’t unusual for an identification guide to have separate plates, but it is unusual to have photographs, sized medium and large, illustrating species accounts as well. That’s a lot of visual information! The initial effect was that I felt like I was looking at two separate guides. The Index points to both sections from common name and scientific name, in case you’re wondering, with plate numbers bolded to separate them from the page number of the species account. A very interesting design, and one that I’ll get back to after fuller descriptions of both sections. Plates: The 32 plates depict each raptor species in plumage stages–adult, immature, juvenile, and differing basic stages and morphs, depending on the species. Male and female plumages are also depicted where there are differences. Raptors are drawn in typical perched positions and in flight–full-soar, gliding, head-on; flight images show both uppersides and underwings. There are also depictions of birds in habitat, like the Bat Falcon in the rain forest, above, and some close-ups of heads or tails. The number of species on each plate varies from one to three, with four species on the last plate, “Vagrants and Introduced.” Swainson’s Hawk, White-tailed Hawk, and Red-tailed Hawk–raptors of many morphs, molts, and, in the case of Red-tailed Hawk, subspecies–rate their own (actually, Red-tailed Hawk technically gets more than one plate since Harlan’s Hawk is treated on the Vagrants plate). The order is roughly taxonomic, with the priority showing similar species together. I really like the composition of the plates, a lively mix of shapes pointing in several directions. Care was taken to place drawings of similar raptor species next to each other, the better to compare field marks and flight images. The left hand page lists Common and Scientific Name of each species and a brief description of the bird, followed by the captions themselves. These focus on field marks, often going into very detailed descriptions of plumage and other physical features. The authors very nicely detail how they worked on the plates together in the Introduction (I love field guide transparency). I did have one problem using the Plates. The authors employ the common practice of denoting each illustration with a number-letter code, which I used to locate the accompanying caption. And vice versa. Looking at the drawings on the right-hand page, then looking at the captions on the left-hand page, my head moved back and forth, back and forth. Again, this is a common practice. But, a consequence of placing similar species next to each other is that the eye needs to scan the whole plate, not just one section of the plate. A lot of eye and head movement, a lot of time looking for the exact image you want. I wonder how difficult it would have been to include species, age, gender, or plumage stage in the plates themselves? Would the text distract from the design and artwork, or enhance it? Is this nitpicking? Do the benefits of having adult and juvenile Gray-lined and Gray Hawks flying next to each other outweigh the confusion of trying to figure out which one is 2a and which one is 1c (adults), which is 2b and which is 1d (juveniles)? N. John Schmitt’s artwork is at the highest level of technical illustration. I find it amazing how much subtle detail has gone into some of these drawings, particularly the feather patterns of the underwings of the kites and kestrels, and the subtle colorations of the morphs of the Swainson’s Hawk. The illustrations of bird behavior–a Laughing Falcon with a kill, Swainson’s, a Crested Caracara with its head thrown back–offer opportunities for a little individual style to shine through. The colors are rich, much deeper and beautiful than the muted inks in my copy of Hawks of North America. 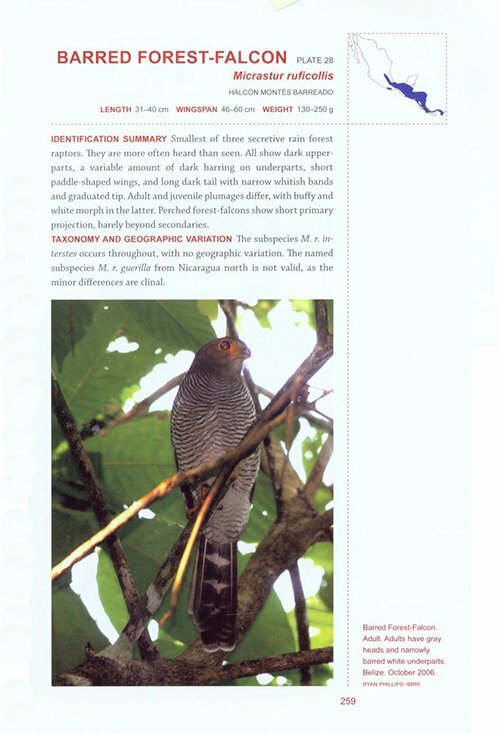 Species Accounts: The Species Accounts provide thorough, highly detailed descriptions of each raptor species as they appear in Mexico and Central America, with an emphasis on molt and plumage. Flight style–soaring, gliding, kiting, wingbeats, courtship flight–is covered under Behavior, but the emphasis, as evidenced by amount of text and the extensive photograph captions, is on physical appearance. The format is similar to that used in Hawks of North America: Names (common, scientific, and, nicely, Spanish); Identification Summary; Measurements; Taxonomy and Geographic Variation (subspecies that occur in Mexico and Central America, recent taxonomic changes); Similar Species (a very valuable section that includes plate references for each similar species); Status and Distribution; Habitat; Behavior (including flight styles); Molt; Description; Fine Points (brief but detailed tips for field identification); Hybrids (if any are known); Etymology (origins of common and scientific names, an interesting feature that you don’t find in most identification guides these days); References. Range maps indicate general distribution and users are referred to country field guides for more detailed maps. Colors indicate where the species is resident, winters, a migrant, winters and a migrant; summer; former range. Interestingly, Raptors of Mexico and Central America does not cover vocalization. I cannot find an explanation in the Introduction (and I will check again before post publication in case I am blind), so I will assume that the same reasons given for its absence in Hawks of North America, 2nd edition still apply: the authors think that calls cannot be adequately communicated by transliteration (ex. : klak-klak, keeear!, keee-REEK) and that vocalizations are best learned in the field and from recordings. This is disappointing. When it is considered an important field mark, vocalizations are cited in species accounts. They are sometimes, but not always, described. So, Double-toothed Kite calls “are high and thin and not very raptor-like…more like those of tyrant flycatchers” (p.129), but Red-shouldered Kites are merely “quite vocal, and birders should learn their distinctive call” (p. 208). 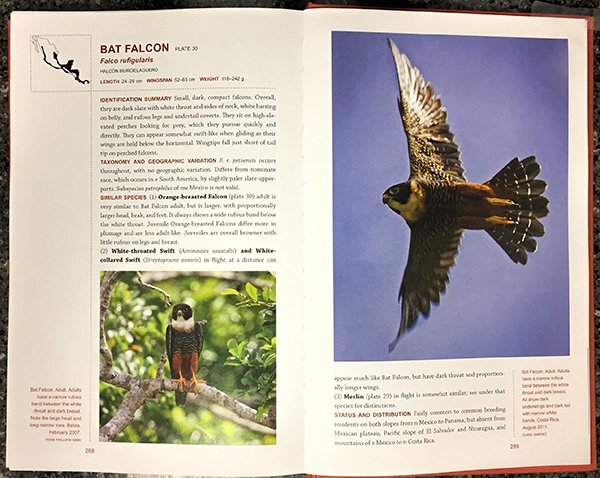 The accounts vary in length from two to six pages, and are well illustrated with photographic images by Ryan Phillips of the Belize Raptor Research Institute and a group of 40 photographers from the United States and Central America. There are some impressive images here, and the book design allows some of the best to be shown off at full and three-quarter page size. The design is almost leisurely in its use of space, featuring large margins, large fonts, and the use of colored typography to set off sections and highlight species. Introduction: I like introductions that give insight into how a book was developed or written or researched (and it’s amazing how often this is not done), so I appreciate the insights given here into the way the two authors worked on the plates together, and of Clark’s research process, which included museum study of specimens, review of the literature, banding measurements, and a final field test of the field marks. The Introduction also gives an outline of the book two sections, with background on how to use certain sections, including an extensive explanation of molt and its terminology. There are also Helpful Facts for Raptor Field Identification, an extensive Raptor Glossary, and labeled drawings of raptor anatomy. 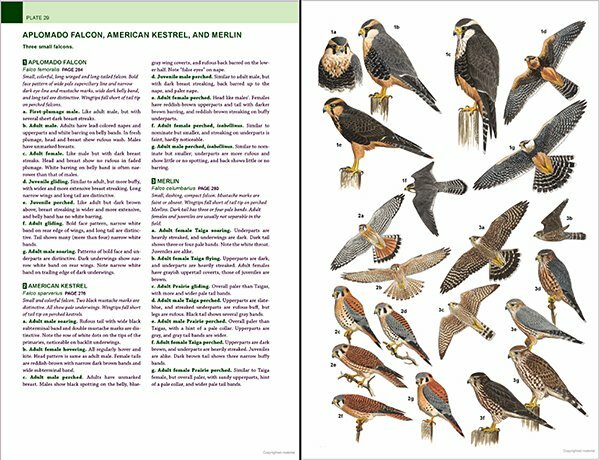 These sections are aimed at newcomers to raptor identification, but in a way confirm my thought that this is a guide for experienced birders. It’s tough to understand a helpful fact about different lengths of secondaries in juvenile and older plumages if you don’t know your secondaries from your primaries. There is an Index in the back of the book, as previously mentioned, and a bibliographic list of references of articles and books referred to in the Species Accounts. It would have been helpful to have also included a resource list of country field guides and online resources such as Xeno-canto (the online crowd-sourced collection of worldwide bird vocalizations), especially in view of the absence of material on calls and songs. The book’s bio is not exaggerating when it says that author William S. Clark is “one of the world’s leading authorities on raptors.” In addition to co-authoring Peterson’s Hawks of North America with Brian K. Wheeler, Clark has co-written A Photographic Guide to North American Raptors (also with Wheeler, PUP, 2009), A Field Guide to the Raptors of Europe, the Middle East, and North Africa (with N. John Schmitt, Oxford Univ. Press, 2000), and over 140 journal and magazine articles and conference proceedings. You can download some of his papers from the Peregrine Fund web site. In addition to co-authoring the raptor field guide, N. John Schmitt has illustrated the diurnal raptors in Birds of Peru (PUP, 2010), the Cornell Lab or Ornithology Handbook of Bird Biology, 3rd ed., and contributed artwork to editions of the National Geographic Field Guide to the Birds of North America. He’s also a birder and former field biologist, thus fulfilling the mandate that first you bird, then you draw. Together, Clark and Schmitt make an excellent team. 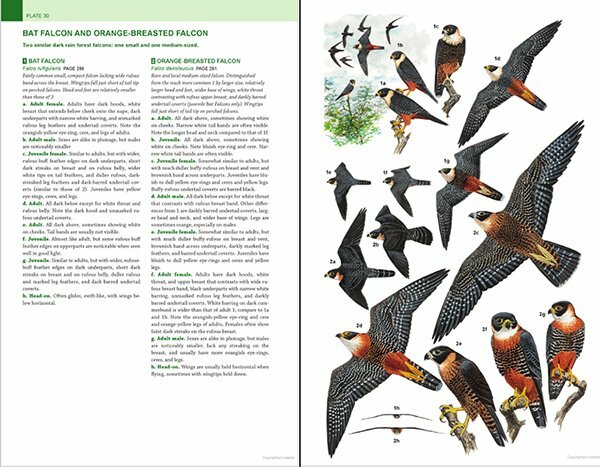 Raptors of Mexico and Central America is an outstanding identification guide, a book of well-thought-out design, carefully researched illustration, beautiful photographs, and comprehensive expertise that fill a very specific geographic niche. Its organization can be challenging. I think the answer is to use the book in different ways, depending on where you are and what you are doing. In the field, the Plates, with their precise, comparative illustrations and captions, are the first place to look for answers in identification. (With any other type of guide, I’d say that this volume is too large and heavy (and, beautiful) to use in the field, but I can see it being used at a hawkwatch. Maybe with a book cover.) The Species Accounts are the research-at-home section. This is a book for hawkwatchers (I’d write obsessed hawkwatchers, but that would be redundant), experienced birders who love hawks, and even, with a bit of study, for novices about to depart to Mexico for the famed Veracruz River of Raptors, or to Panama’s migration highway, Ancon Hill or to the Kèköldi Indigenous Reserve in Costa Rica, where over four million raptors migrate through. (And, if you’re looking for a good hawkwatch tour down south, check out the offerings of the nonprofit HMANA, Hawk Migration Association of North America.) It’s not hard to understand why there is such a fascination with hawks, eagles, falcons, and every other type of raptor, even if your heart belongs to warblers or shorebirds or hummingbirds. From huge Condors to petite Kestrels, raptors of any size embody fearlessness, power, and grace; they embrace the space of the skies with attitude and mastery. All we need to do is lift our heads and observe, study, identify, and then observe again. A good book helps. I have to tell you, I am very excited about this book. I had heard rumors of it from a couple of Mexican Ornithologists, I have to make a very quick trip to Seattle, so I am having one sent from Amazon. I will have it on Thursday!! Something to read on the flight back. Thank you very much for this great review. Thanks, Tom! It is a pleasure to have a book on hawks published that covers new territory, and a very important one too. I was able to pick up my copy while in the US 10 days ago, and have now read it cover to cover! Long airplane flights help. Beautiful book, and a real treasure for me down here in Mexico!